If you follow us on Instagram then you have probably been seeing little peeks into what I am considering my biggest project of 2017–our master bathroom renovation. And I have some very exciting news: It’s finally complete and I’m ready to give you all a little tour!!!! 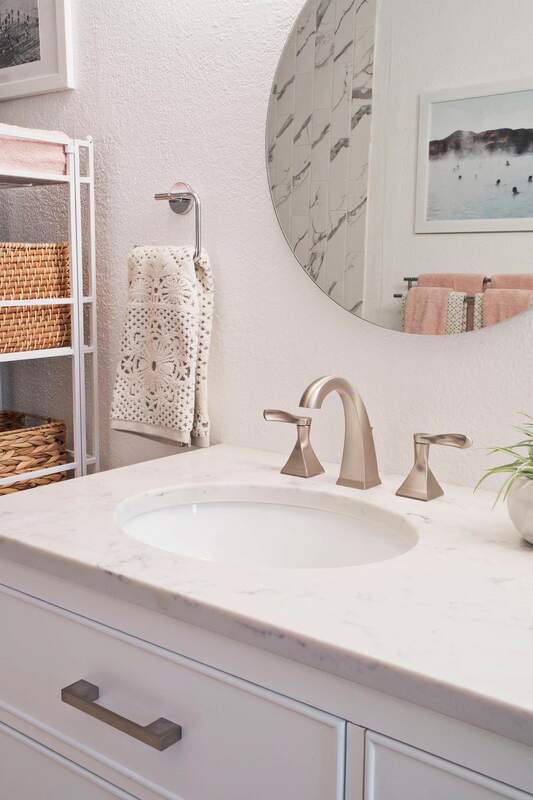 I was super excited to work with Delta Faucet and The Home Depot on this room renovation. 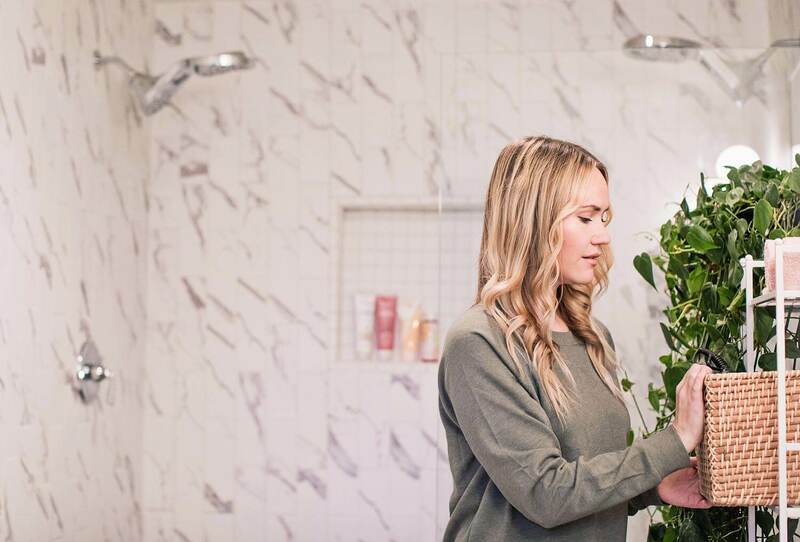 Elsie and I both love Delta Faucet and you may remember the pretty black faucets Elsie used in her Airbnb bathroom, and if not then check it out here. My goal was make our master bathroom feel more like us and also give it a little bit of a spa vibe. 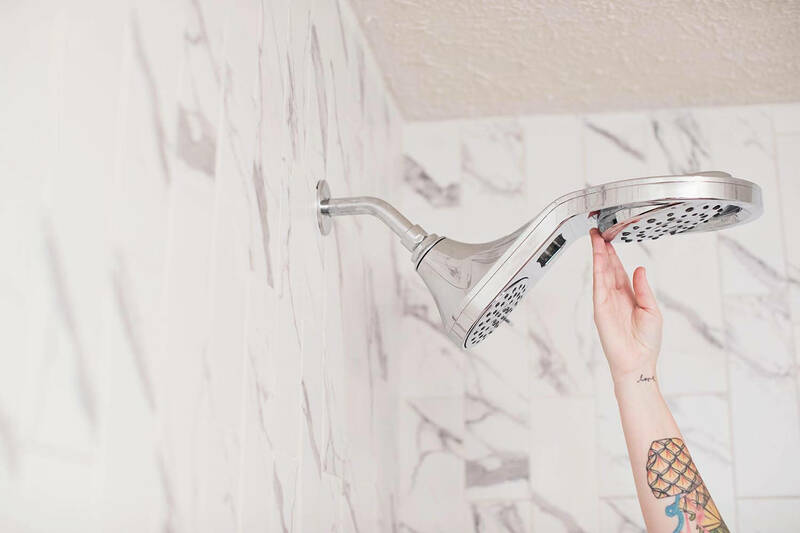 I was excited to use the Everly faucets and the two HydroRain 2-in-1 Shower Heads, they were perfect for our space! I was wanting something in the silver/chrome family as well as a design that felt sleek and modern (and a little bit like, well, a spa) and this totally fit the bill. 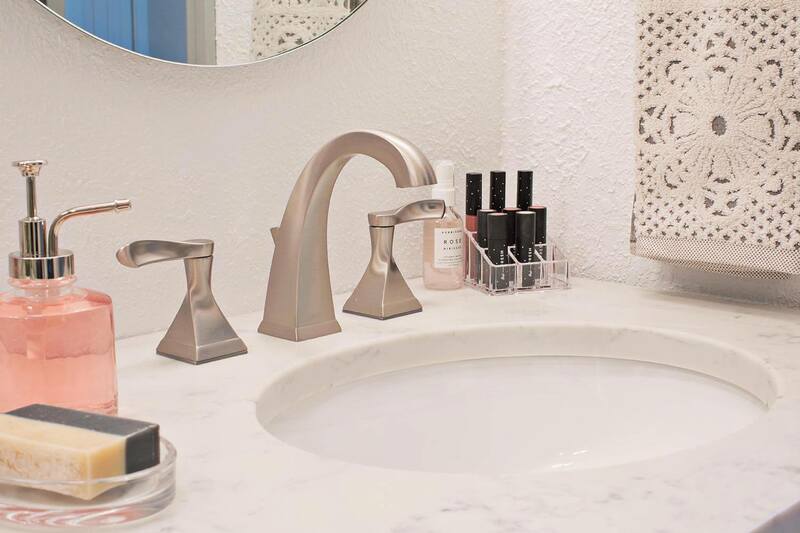 The Everly faucets also resist water spots and fingerprints, which is definitely a bonus when it comes time to clean because they stay cleaner longer! 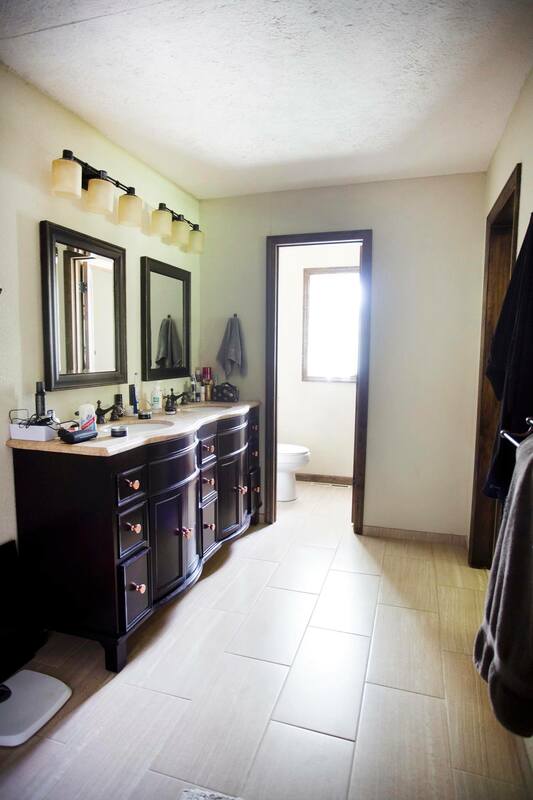 I’ll share where everything in the room is from, but first here’s a few more looks inside the finished bathroom. The space is like a long rectangle with a double shower on one end and water closet (with toilet) on the other, plus a vanity space in the center. Compared to our last home, this bathroom is HUGE and the first two years we lived here we didn’t change anything about the space. We just enjoyed all the room and I plotted to change things out to be more our style later. So as I said, we love how much space this bathroom has. It’s totally amazing to have two sinks and two showers and it makes getting ready in the morning with your spouse too easy. So, loved the space. But what we didn’t really love was how dark the room felt, and very, very beige. We also didn’t love the oversized vanity that was not our style and was so big it was easy to clutter up the cabinets and lose track of things. For how big the room is it felt like we weren’t really utilizing large portions of it, as we never figured out what to do with the space between the vanity and shower. And I never really loved the little half wall that separated the shower from the rest of the room. It just didn’t feel very intentional to me. 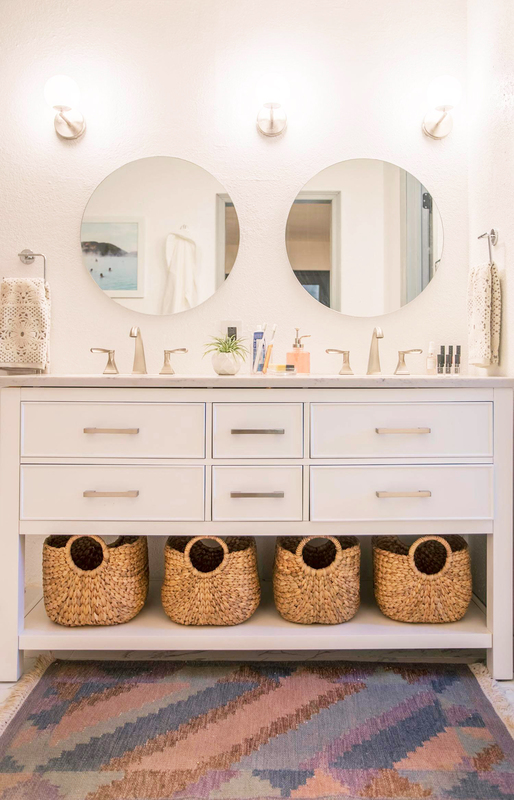 We plotted and planned and landed on lots of white, silver/chrome, modern features, and pretty details–plus we aimed to create our own little at-home spa oasis. (How many times will I say “spa” in this post … sorry, just trying to communicate what was in my head for this room. Ha!) And once the plans were in place, I hired my friend Ethan to help me and we dove right into this project. Here’s a look at the room as we were in the middle of demo. What was going on in my head at this point? I was feeling very sore in places I didn’t even know I had muscles in, and kind of wondering if I’d made a big mistake and bitten off a little more than I could chew. But hey, it’s gotta get worse before it gets better, right? Also, as a quick side note, remember that large vanity that was not our style? Even though we didn’t love it, it was in great shape and we knew that someone else would. So we donated it to our local chapter of Habitat for Humanity (for the ReStore). I mention that only to say if you’re planning a project like this in your future, remember to donate items when you can to places like HFH or other charitable organizations in your area. I think we tiled for about a week straight. There’s a LOT of tile in this room. The marble-looking porcelain tile I used is from Home Depot and I really liked working with it. 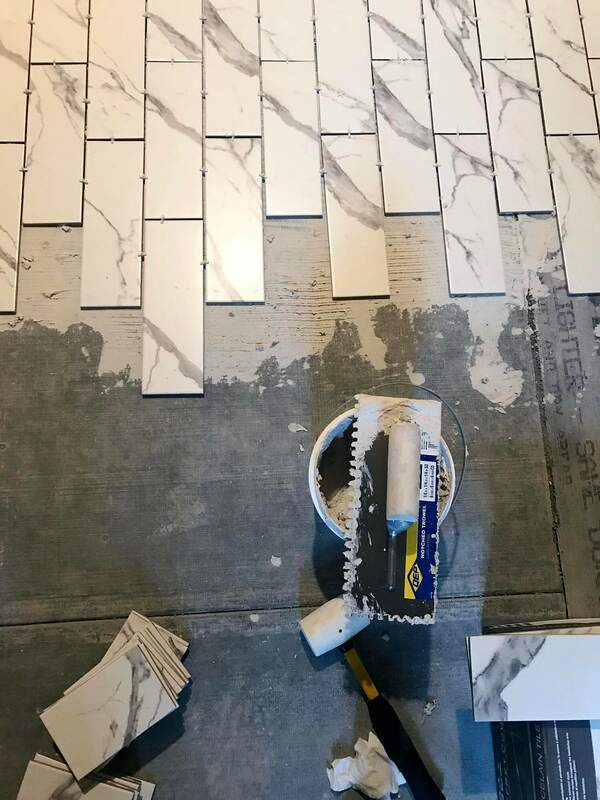 If you remember when we tiled our kitchen backsplash, we used a real marble tile there and I thought porcelain was much easier to work with. Of course, it depends on the look you want, your budget, and what the space will be used for, etc. But if you’re new to tiling I do think porcelain is awesome to work with and a little easier than stone. Meanwhile, we had a few items in the room that were not a DIY and we got those ordered and going before we started in on all that demo and tiling. 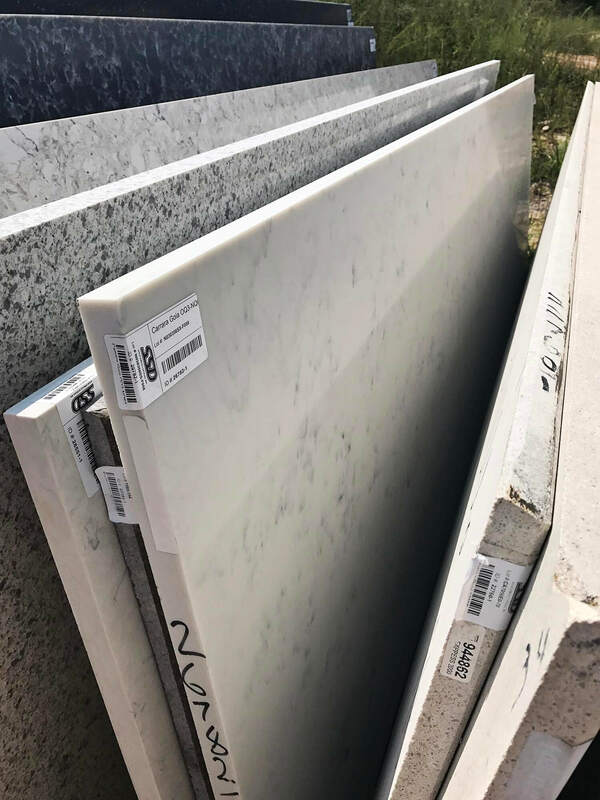 First, I knew I wanted a marble looking countertop for the new vanity. But I decided to get a marble-looking quartz over real marble, as I wanted something super durable and that would hold up really, really well against any kind of stain, including water stains. And although our vanity is a great size with two sinks, it’s not a whole kitchen counter situation. So we were able to choose a remnant piece (left over stock from another job) that we had to cut to fit our vanity and sinks. I highly recommend this if the option is available to you. 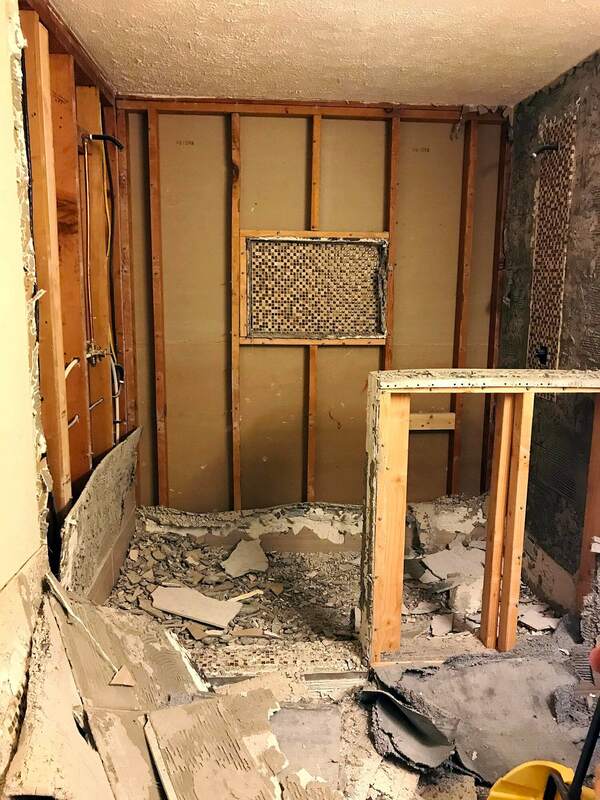 Second, we decided to pull the trigger and remove the half wall that separated the shower from the rest of the room and replace it with one large pane of glass. I used a local glass company in Springfield, MO where I live and I love how it turned out. If you’re local and need a glass guy, email me because I would totally recommend the company I used. They were great! -Added about 100 baskets for storage; just kidding, it’s only 9 baskets total. Sources: Faucets/Home Depot, shower heads/Home Depot, tile/Home Depot, vanity/Home Depot, mirrors, and sconces/Home Depot, shelf units/Home Depot, baskets/World Market, Target, and TJ Maxx. Bath mat and towels/World Market. Black and white print/Randal Ford. Purple kilim rug/Ebay. Bathrobe/IKEA.The blue Lagoon picture taken by me on vacation two years ago. Let me know if I missed anything you want to know about! Credits // Author: Emma Chapman. Project Assistant: Ethan Randolph. Photography: Janae Hardy and Emma Chapman. Photos edited with A Color Story Desktop. Hi Emma! Beautiful new bathroom! I’m curious though, does the shower not close all the way? like no sliding door or curtain? Seems like it could get chilly! No, it does not close at all. Our previous shower situation (before reno) didn’t either. So we’re kind of used to it, but it is fairly unique. It is kind of chilly during the first part of the shower, while the water is heating up, but then it’s not too bad and the glass will fog up a bit before you’re done. I don’t take super long showers most of the time so it doesn’t really have time to heat up too much, but if you took a long one it would. I love your bathroom, you made great choices and did a great job on it. 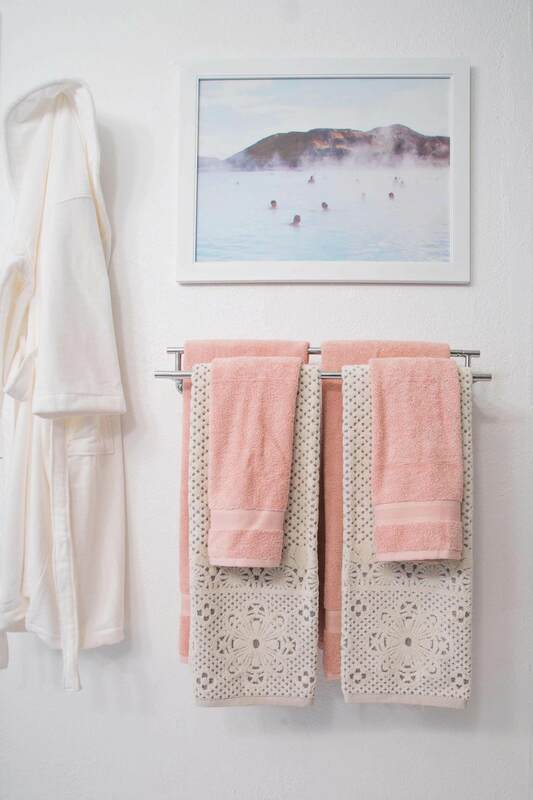 The towels are so dreamy! Would you say they are thick and dry you well? I’m so impressed! It has such a pretty and clean look to it! Great job on the bathroom, looks amazing. But what has been really standing out on your last two post is your plants, wow! Can you share a post about that green thumb of yours?! Maybe a #sisterstyle + plants + Oui Fresh Plant Lady gear! 😉 Do you buy the plants full grown like this or do they just grow this big? Thanks! Ha! I agree. I think pretty plants always steal the show. 🙂 I honestly do not have a very green thumb so I’ve been trying to get lots of tips for keeping my plants alive. I recently (like two months ago or so) got a bunch of beautiful, very grown, plants from a friend who was moving to another city and couldn’t take all her plants. So that’s pretty much why my house looks like a greenhouse right now—fingers crossed I can keep them all alive and healthy. I NEED that rug and I can’t find it anywhere D: This bathroom is gorgeous btw! It’s from Ebay. I just got on there and search turkish rugs in the size I needed. Based on some slight discoloration (and a little bit of funky smell when it arrived) I’d guess this one is at least old and maybe vintage. But I don’t really know, I just liked the overall design, colors, and size for my space. It’s the perfect design and colors!! I’ll check out ebay. Thanks! I love what you’ve done with thee space and I can only hope to have a pathos plant like that one day!! 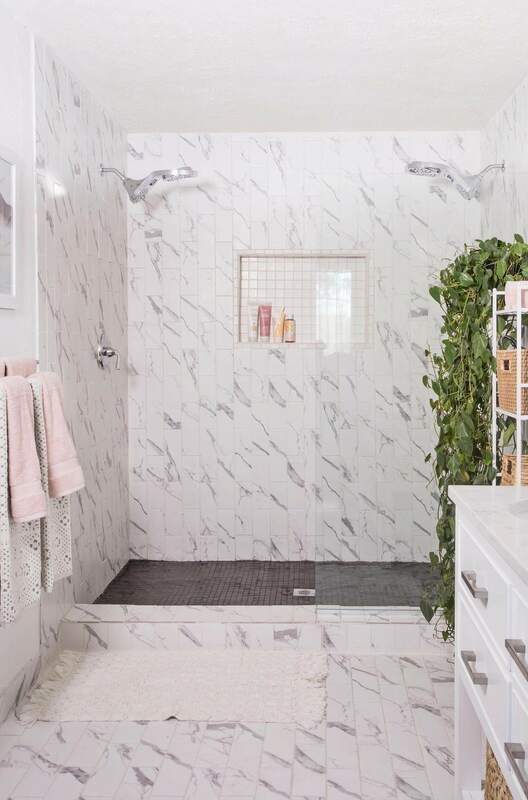 It looks incredible now, love the details (especially the rug) and I would really like to try out that shower head! I just added that shower head to my bathroom remodel Pinterest board last week. Glad to hear you like it! Everything looks really beautiful and very SPA-like. 🙂 The shower looks amazing. Since you basically did an entire gut job, just curious if you considered removing the texture from the walls? Did that come up, or was it not a factor for you? Honestly, I really don’t love the texture of the walls. All the walls in our home are exactly like these in the bathroom too. But our home is older (built late 1960s) and since we’ve been living here (about 2 years now) we’ve had multiple new cracks and settling marks in the walls. We do not have a foundation problem, but it’s an old house and it settles. So basically, I didn’t think it would be worth it to get flat walls, which is probably what I’d prefer if I got to choose anything and knew it would last. Also, in my last home I went to the trouble/expense of removing the popcorn ceilings in our house (I don’t love those either) and if I had to do it over I would just leave them. Although I don’t love the texture, the expense and mess it made to remove really wasn’t worth it in the end. Of course this is all personal preference, but yeah. 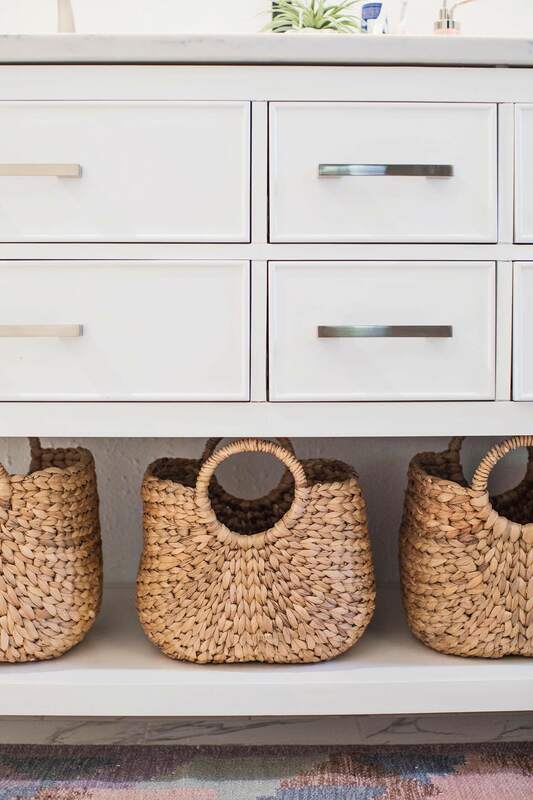 I love all the baskets, but what do you store in them? All our bathroom stuff. Make up, hair blow dryer, flat iron, hair products, sun screens, lotions, extra shampoo, cotton balls, nail polish…. you get the picture. They are honestly already decently full from everything we already had before the renovation but it all feels SO much more organized and accessible than it did in the big oversized vanity we had before. 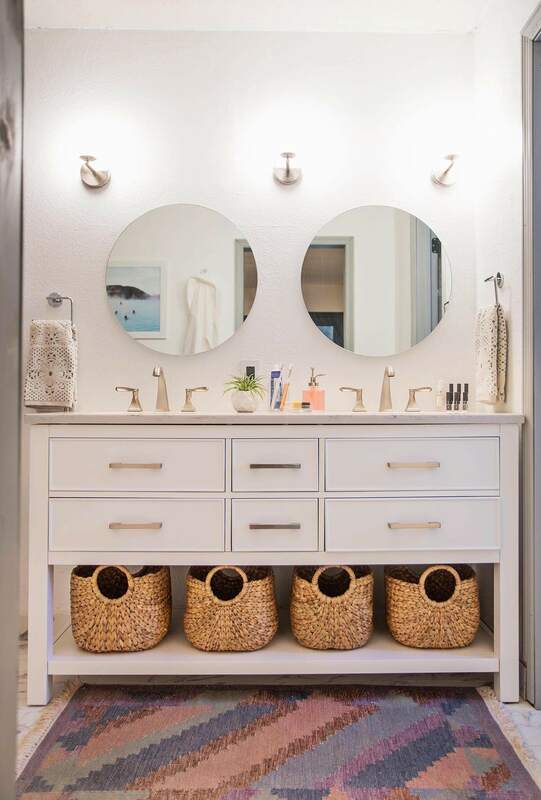 Can you share where you got the baskets at the bottom of the vanity? What a dreamy renovation! This bathroom is absolutely beautiful, I’d never want to leave it! I just adore the sink/vanity, so classy. gorgeous! love the colors. 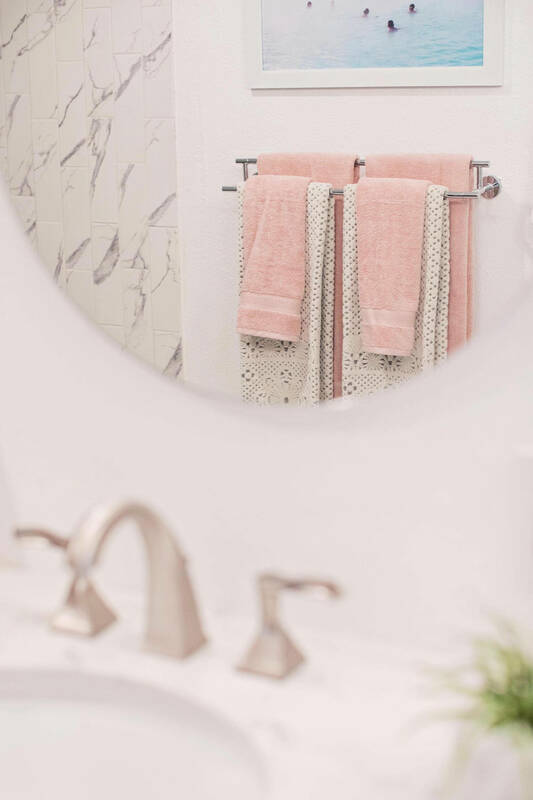 obsessed with the towels and just realized there is a World Market 10 minutes from me and I am scared for my bank account right now, haha!! Ha! Yeah, I’m actually kind of thankful we don’t have one in my town. I was on a trip to KC with my mom when I bought some things from World Market, including some stuff for our bathroom. Love this room!! 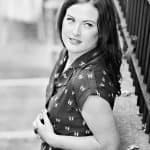 It looks incredible, these are some of my favourite blog posts – loving the before and after shots. I always find your home renovations so inspiring and they make me want to give it more of a go. Hi Emma amazing job! Can I ask if you framed your prints in a special way to make them more waterproof? I really want to hang some art in our bathroom but I’m worried about moisture ruining them! I’m curious about the time associated with tiling. We want to remove our shower “surround” (which are just fiberglass panels right now) and replace with a subway tile. We’d probably hire it out, instead of diy. BUT. We only have one shower in our house. Is this something that could be done in a weekend, you think? It’s a standard size tub situation. Great reno! Besides the ease of working with porcelain, do you think the porcelain tile feels/looks as good as marble? If ease of use and $$$ weren’t a consideration, would marble be preferred, now that you are done with it? I love the tiles you chose! 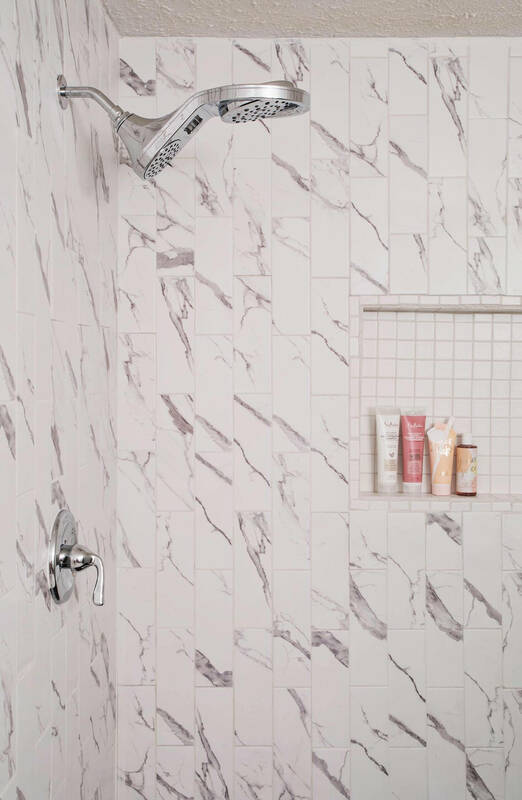 I’ve never seen marble effect subway tiles before but they look amazing! It looks so much brighter in there now. We’ve been ‘renovatin’ our bathroom for the past 4 years (ha) and this has inspired me to get it finished! It looks great! I’m curious as to how you coped with the crooked walls as a DIYer. We own a house built in 1923 and every single angle in this house isn’t square. On top of that, the previous homeowner was a BAD DIYer and didn’t bother fixing things the right way, so we’ve got a bad combination of poor tile installation and some UGLY choices that we need to fix. But the crooked walls and angles have intimidated us from attempting to tackle it. Was it maddening, or would you do it yourself again? I’ve had those white + gray towels from World Market for roughly 3 years now, and they are still very fluffy and plush feeling! LOVE them. I bought some solid gray ones there to coordinate at the same time that I have since given away (only because I had wayyy too many towels, no quality issues), both sets have held up very well. Though if anything, the burn-out suzani white + gray ones have done better than the solid gray. Super great prices, nice deep selection of styles (from wash rags to bath sheets, etc). When I got them I wondered what took me so long! The round mirrors are lovely! It’s brilliant how a simple tile change can set a completely new tone to the room. It’s much brighter now and there’s a room for other colors as well. Great work. The Home Depot basket shelf you linked to has dimensions smaller than the Target baskets you linked to. 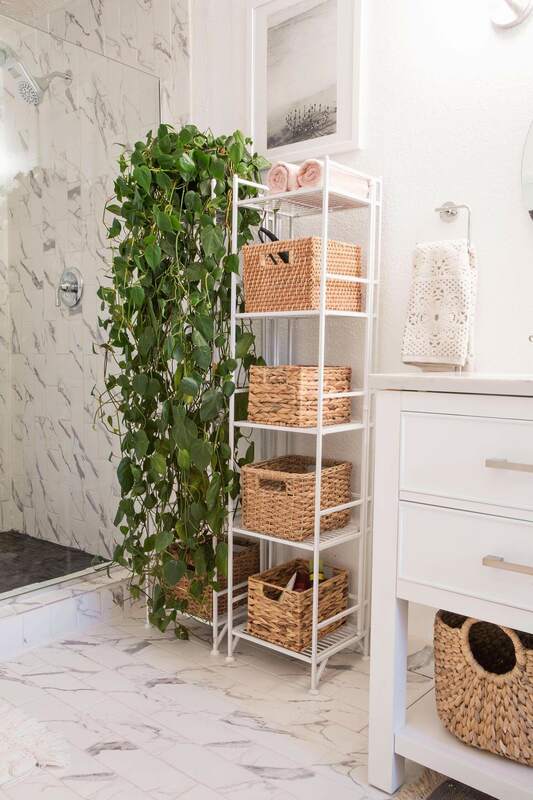 Are these links incorrect or do the baskets actually fit into the shelf? I love the watering can-inspired soap dispenser with pink soap! Absolutely gorgeous! Amazing job on the renovation ? Did you say where the towel rack is from? Thank you! Wow what an incredible transformation. And I love that you added plants! A real work of art and inspiration… Amazed by the perfection of the interior designers, and Yes! the ideators who proposed to do this… However, it was already very cool before the renovation… Overall great Effort!! 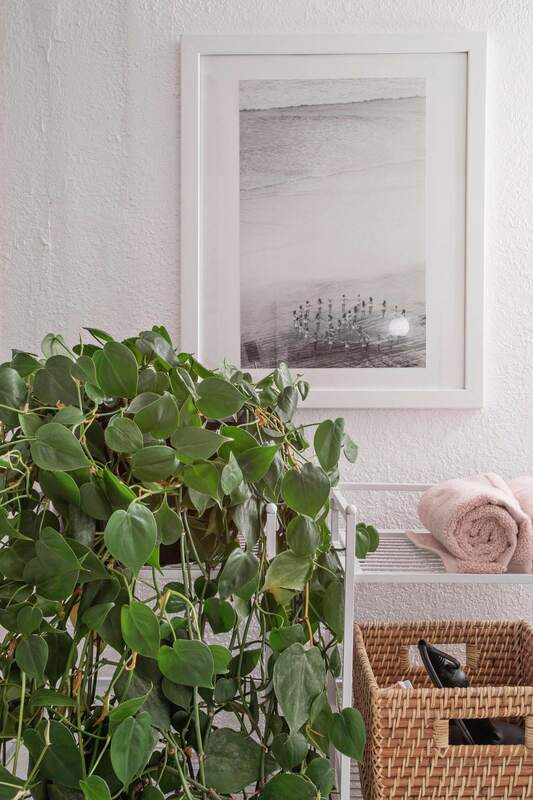 I want to know more about how you’re keeping that plant alive and bringing a spa vibe to the room with no windows (if I’m correct that there are no windows?)! 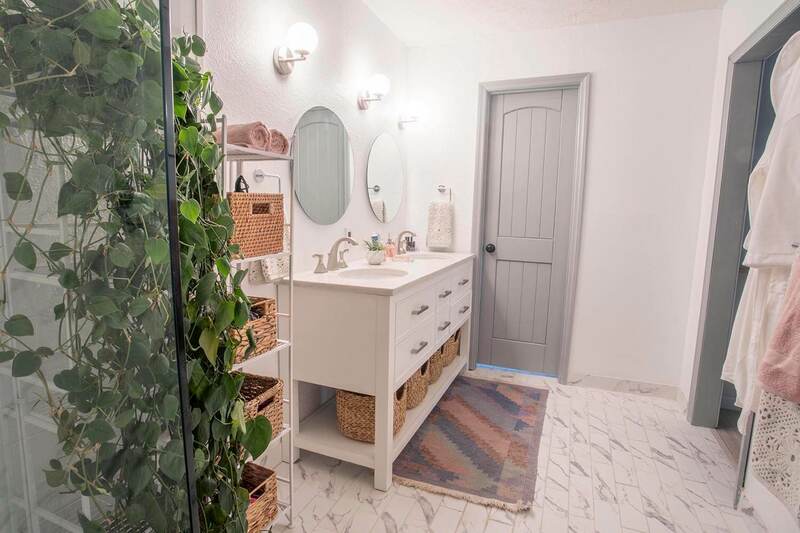 We have an extremely similar layout to the master bath in our house, including the large tiled shower taking up an entire end, but with no windows I both find it kind of claustrophobic and totally confused about to bring any plant life. 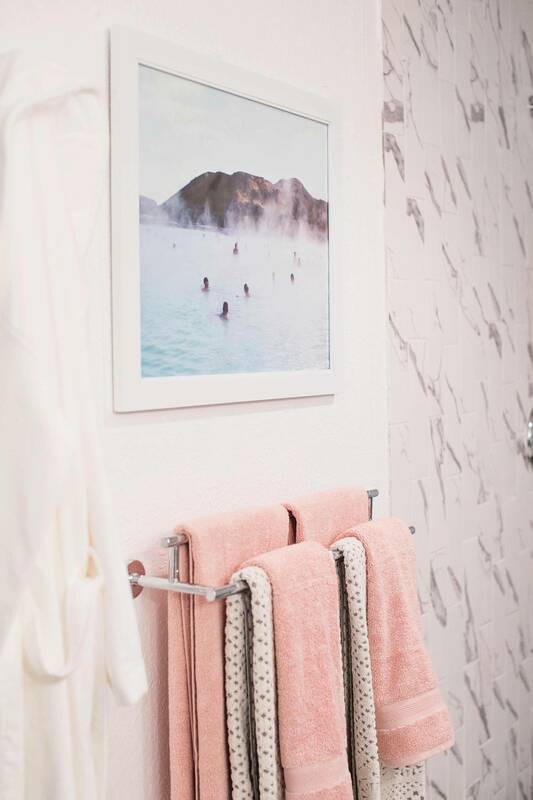 Also would really like to know where you got that towel rack because given the similar shape of our bathrooms – but our is in a big L instead of a rectangle – having trouble figuring out how to place towels right outside the shower and get any airflow on them for them to dry. I loved it.. the entire transformation into a much lively room! The spaces, the plants and the aura it has- has indeed increased the overall design value. This might be a silly question, but where did you get the toothbrush/toothpaste holder? I have the same toothbrush and toothpaste, and this would be perfect for my space! 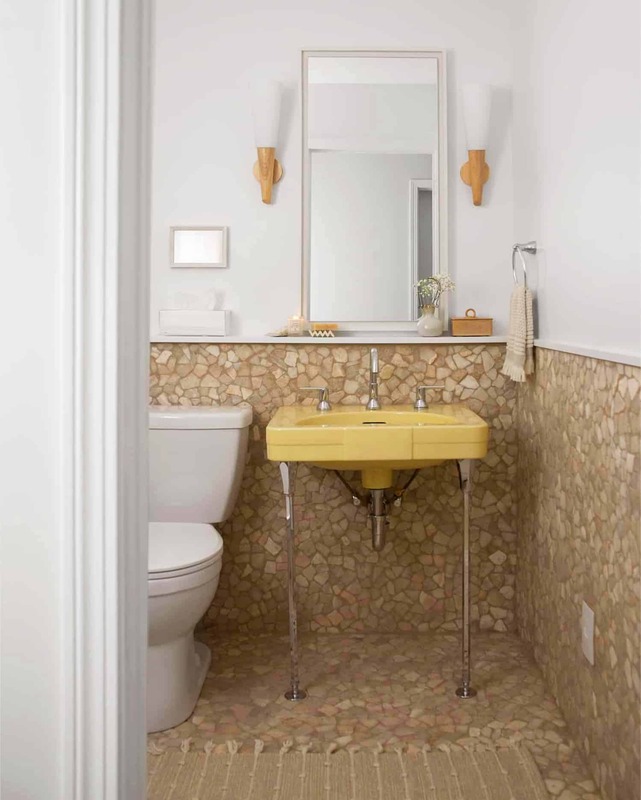 I’ve pinned your bathroom and am using the vanity as inspiration on our reno. I LOVE the “furniture” look of it where there is space all of the way under the bottom shelf to the wall. However, my husband thinks it would collect dust and be a pain to clean underneath. Now that you’ve lived with yours for some time, what are your thoughts about this? I love the look, but don’t want to collect dust and hair and make more work for myself. Help! I love how bright this bathroom is now! We are redoing one of the bathrooms in our house so this is very inspiring! Where are the towel rods from? This is an option when your bathroom fixtures, the knobs on the faucets and such, are still in good condition but your bathtub and/or your shower stall is looking a little shabby. 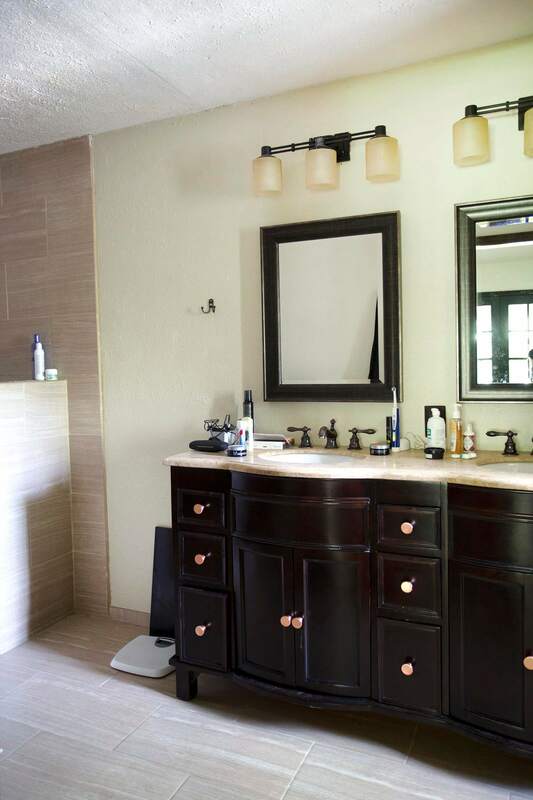 When that’s the case, a surface-level bathroom remodeling can give you the feel of a whole new bathroom, without the price tag. It’s a great project to take on if you don’t have the budget for a complete overhaul just yet. The rule of thumb to follow here is, “Cover, don’t replace.” Replacement adds to the time and costs of a remodel because you’re paying to have what’s there already removed. Covering uses the structure of what’s already there and simply gives it a new face. Some of the not-so-pricey items you need to invest in when doing a surface-level bathroom remodeling include prefabricated shower units, bathtub or shower liners, bathtub refinishing, and easy-to-install wainscoting. Hello Emma, thanks for sharing this amazing post. It looks incredible, these are some of my favorite kind of posts. Loving the before and after shots. I always find your home renovations so inspiring and they make me want to give it more of a go. Thanks again! What your renovation idea for your master bedroom? 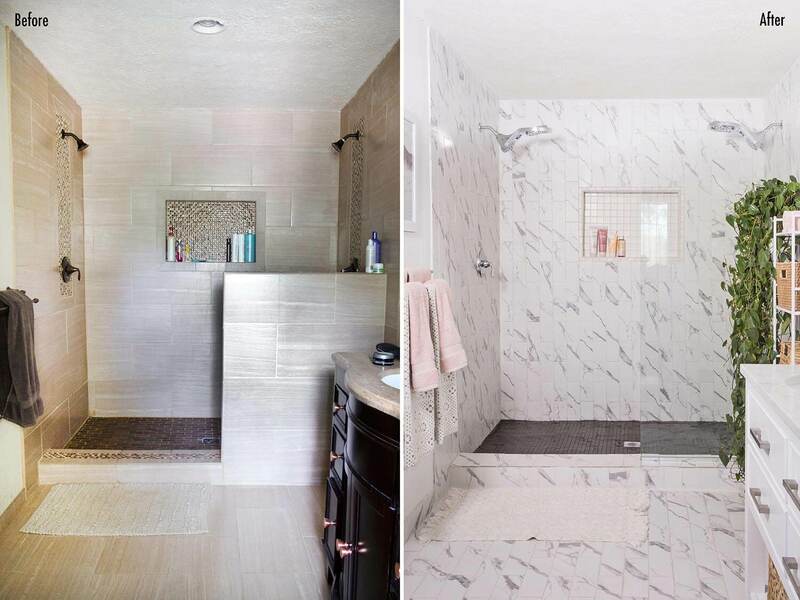 What do you want to add that is not there now and how will it improve your shower experience? These are some of the questions to answer before you renovate your master bathroom. Don’t just restore by painting and forget about other appliances such as faucets. Hi Emma, I love your bathrooms, excellent design. The finished works look amazing! Hi Emma, love your designs and talent for making them look great! That shower head looks amazing, where can I get one?